Genre combination is a thing, and sometimes great things come from it. Queen's "Bohemian Rhapsody" is a prime example of taking two music genres that seem like polar opposites and melding them together to form a masterpiece, provided it's done well. Sometimes we get strange results. Anyone remember "Cotton-Eye Joe" by Rednex? The combination of folksy country twangs and thumping dance beats seemed pretty bizarre, even though it probably tore through more Grade 8 dances in 1995 than I could possibly imagine. 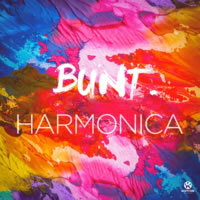 Well, we're not through testing the waters of these two genres, thanks in part to German duo BUNT., and their unusual track, "Harmonica". Starting off with the Radio Edit, there's a hearty blend of acoustic guitar and piano that together deliver a sound of the South as the titular harmonica briefly breaks in before a male vocalist with a clear Southern accent starts crooning a bit about his lost lady love. At first, I thought these were terrible vocals, unfitting of an electronic dance track, but they do grow on you like moss on a moist tree trunk. Then BAM!, the reverbed harmonica shouts out its emotions as best it can over some standard beats. To be honest, you'll remember the melody of the country singer over the harmonica. The formula repeats a second time before the radio version closes rather suddenly. Overall, there's some soul in this tune, and although you may shun it off as being corny (which, I'll admit, it is), parts of it are earwormish in nature. BUNT. has also provided an Extended Mix, which basically adds some calming house beats at the opening and closing of the track. Do you like country music? You'll probably get a kick out of this. Do you hate country music but are a fan of house? Then there's a distinct possibility you'll still find something to like about this one. There aren't a ton of popular country/house clashes out there, so this track definitely stands out as something deviating from the norm.